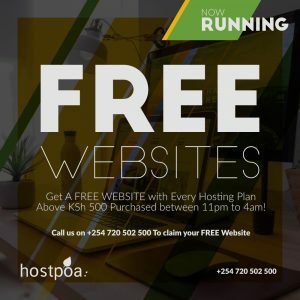 When choosing a hosting in Kenya, You need to be sure that you are choosing the right web host. With all the options to choose from, you need to ask the right questions for you to get a hosting plan that suits your needs. We have prepared a info-graphic that takes you through the steps you need to take when choosing hosting in kenya. Step 1. Ascertain your Needs When Choosing Hosting in Kenya. What are trying to do with your domain name. If you only need a simple website and a few emails, a cheaper hosting plan is sufficient. 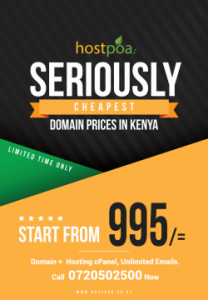 Some hosting plans like the one in hostPoa have a Web-hosting package that has a .ke Domain, Unlimited Email accounts, Own cPanel, Unlimited databases & a Ready website all for KSh 995. This comes as an advantage to the price sensitive buyer. Some people need to build dynamic websites with multifaceted interfaces while others need to build just a small website that provides information about their business. When choosing this or any other plan, you need to understand your needs in order to pay for what you actually need. Step 2. Find out what level of support you need. If you and your whole team are going to be using emails from this domain name, you need a hosting service that has great customer support in order to allow for the quick resolution of issues that may come up. You need to ascertain whether the hosting package that you are choosing allows for room to expand to higher packages once you have reached the limit of your current package. The upgrading also needs to be simple and seamless. When choosing hosting in Kenya, you need to be sure that you can easily increase your capacity or else you may find yourself having to transfer to a different host. When looking for hosting in kenya, you need to find out whether their system is integrated with M-Pesa and that the process is instant. When you pay through your mobile phone, your domain name should automatically activate without the need for human intervention. This will be a useful factor when making the annual payment for hosting. 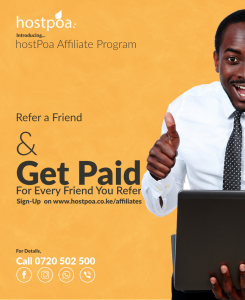 hostPoa provides all of these benefits. Know your options by viewing the packages available and start to leverage the power of the Internet for your business.